Ask any skilled problem-solver what the key tool is for formulating a solution, and you will inevitably arrive at one inescapable answer: imagination. There are many problems in the world, and some are far more serious than others. World peace, financial inclusion, poverty, homelessness... I could go on. But each of these problems is solve-able. Some have become bitter and discontent over the years as they grow older, caught in the treadmill of daily life as they see the world struggle to free itself from the shackles of historic limitations and conflicts. Perhaps it's a side-effect of my crypto-colored glasses, but I see this struggle in what Ripple, Coil, and various other fintech companies are trying to accomplish - on all fronts. They are building the next generation of financial systems and payment rails that will make sending money as easy as sending a text message, and yet we see inertia from powerful financial interests. In some cases, traditional organizations will refuse to change until they are forced to because of competition. Asheesh Birla mentioned this concept in one of his presentations recently. One way that we crypto owners and fans can contribute is through helping others see what could be. I can visualize the world as it should be; it should be as easy to send money to anybody in another country as sending them information. We could use cryptocurrency for micropayments to enable whole new forms of fund-raising for those in need. And we can use the collective might of the crypto market and the crypto community to address limited thinking on the part of obtuse leaders who are preventing this future from becoming a reality. One of our tools is imagination, and we are now sharpening that tool in the form of creative content: Writing. YouTube videos. Memes. Art. Short stories. Through our efforts, we can help each other visualize the future, and once we collectively have that same vision, nothing can stop us. There were two major announcements from Ripple that were impossible to miss. The shocking statistic: Out of the total population of eighteen million, there are approximately one million orphans. "Raising Malawi supports orphans and vulnerable children in Malawi through health, education and community support"
"We’re honored to be a part of Raising Malawi’s amazing work with some of the world’s most under-served children and are grateful to our investors at Sound Ventures for making the introduction to us and this important cause." 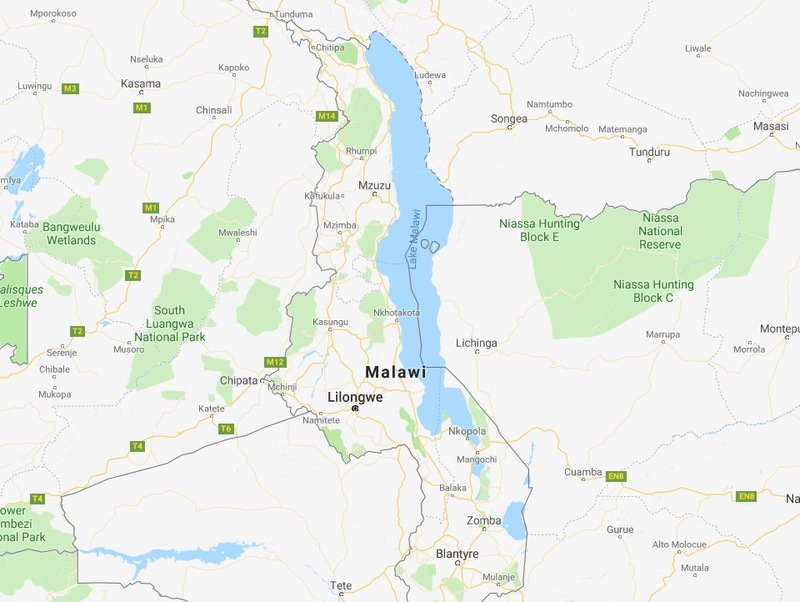 It's my belief that Raising Malawi is one of those charitable organizations that directly addresses desperate conditions in a part of the world where the need is greatest. While many in the West debate about an entirely different set of problems, orphaned children in other parts of the world struggle for basic survival - some tragically without parents. Not only is this a worthy cause, it assists our fellow human beings with inclusion in the larger world, not only providing survival, but education and hope for the future as well. Kudos to Ripple once again for showing their steel-spined leadership as they reach out to help the most vulnerable among us. 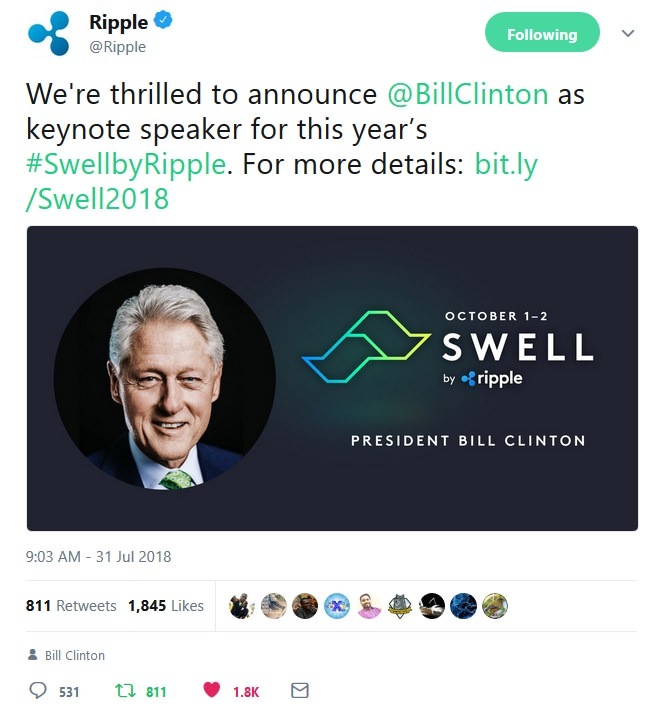 Running a close second in terms of high-profile visibility was Ripple's booking of Bill Clinton as a keynote speaker for the second SWELL conference. "At a time when groundbreaking technology and regulation were often on a collision course, President Clinton helped usher in a period of extreme growth and adoption of the Internet, shaping what it is today. He also established programs that bridged the “digital divide” and brought new technology to under-served communities around the world." Last year, I was amazed by SWELL's keynote speaker list, which included Dr. Ben Bernanke, Sir Tim Berners-Lee, and Don Tapscott. 9 Given the enormity of that group's influence in the global financial markets and forward thinking about the direction of technology, I was truly skeptical that Ripple would be able to raise the bar. Ripple released a new video on August 1st titled "Liquidity Provisioning with RippleNet:"
The video begins by discussing the current state of banks' usage of Nostro accounts, along with how much settlement costs are influenced by this present 'status quo' in banking. While banks will be curious about exploring some of these options, it's evidence of Ripple's continued standardization of its liquidity sourcing options and customer experience for both financial institutions and banks. Of course, this video will find much enthusiasm within the XRP Community; the timing of the video is on-point as well, given the date of the SWELL conference scheduled two months from now. "As much as 50 per cent of cash trading in cryptocurrency has taken place in Japan, so that is a nice place for us to start." The target market for the derivatives platform is institutional (larger) investors and financial institutions. There are some existing derivative platforms such as CME Group, but as a whole, the crypto market is still under-represented; this investment by SBI Holdings demonstrates its methodical approach to vertically integrate all aspects of cryptocurrency, including, among others, mining, trading, and hedging. 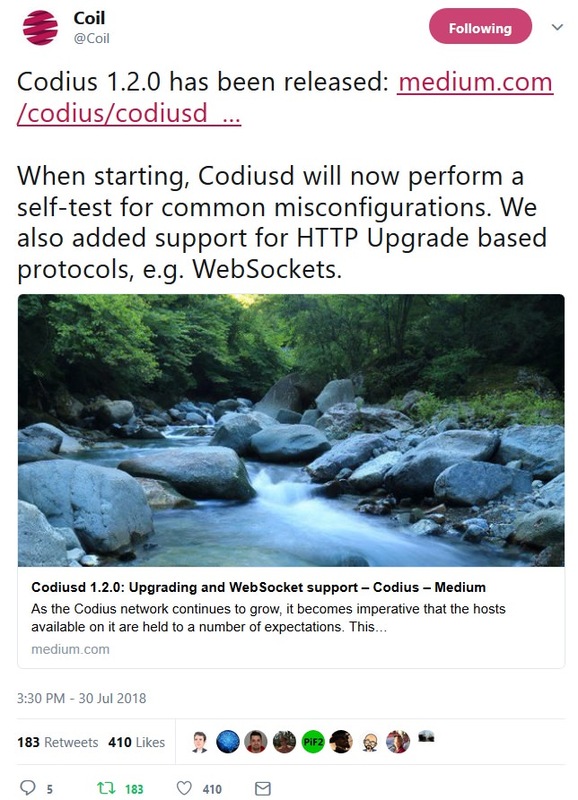 Among other things, this new version of Codius checks that each host fully supports WebSockets, which is a popular and secure way for distributed application developers to connect to external resources over the Internet. "...bar the host from being discovered by the rest of the network." This is a necessary step in ensuring that the entire Codius network is comprised of hosts that can successfully support contributors' decentralized applications and smart contracts. Congratulations to the Coil team on the new release of Codius 1.2.0. In my most recent blog, I described the news that Bitrue, a growing new Singaporean exchange, decided to use XRP as its cryptocurrency base pairing. This development followed on the heels of many exchanges adding direct fiat pairings to XRP; it's the beginning of XRP's rise as the primary method of quickly moving value into and out of exchanges, as traders can do so in under four seconds. It turns out that Bitrue was only the start: Two more exchanges have decided to use XRP as their base cryptocurrency pairing as well: DCEX and Koinex. DCEX is well-connected. Their platform was built by AlphaPoint, the company behind the technology that also underpins other high-profile exchanges such as The Royal Mint and the London Block Exchange (LBX). 16 And which company, in turn, invested in DCEX? Michael Novogratz’s firm Galaxy Digital Ventures. Michael Novogratz is a well-known billionaire investor in blockchain technology companies. 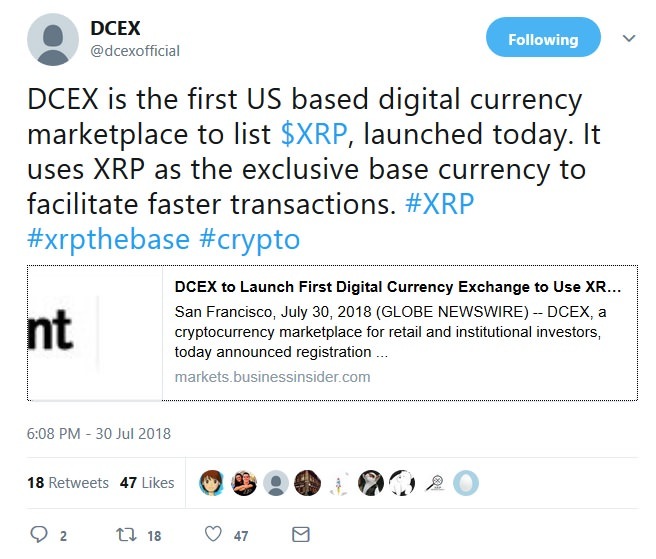 Based on its innovative technology, its usage of XRP as the exchange's base pairing, and the aforementioned impressive set of investors and industry connections, I predict that DCEX has the potential to become one of the top US-based exchanges. The increasing usage of XRP as a base pairing among exchanges serves to make trader-based arbitrage more straight-forward. Unlike the clunky usage of other cryptocurrencies, XRP can settle with finality in under four seconds, facilitating quick price discovery globally, no matter where the exchange is located. 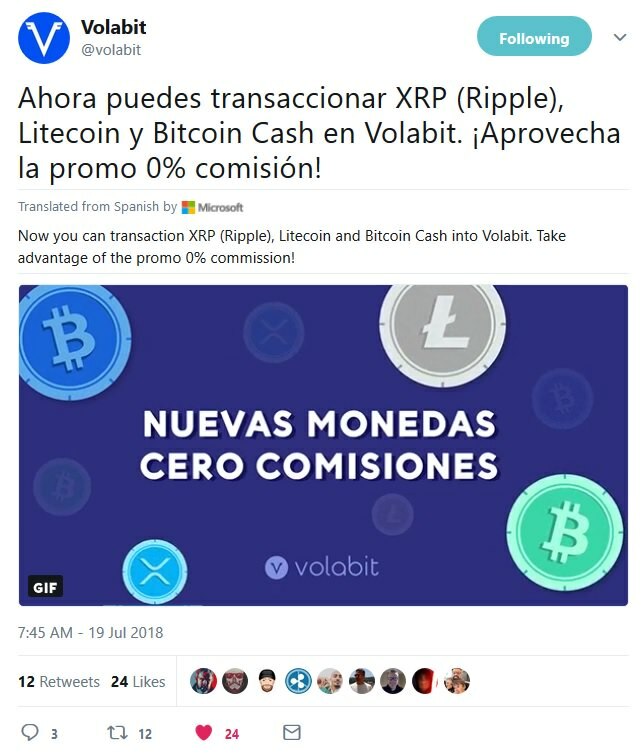 It's no wonder Miguel Vias from Ripple recently started a new and popular hashtag: #xrpthebase. In addition to this list, keep in mind that the influence of Bitcoin as the gate-keeper to the cryptocurrency market is waning very quickly. In the early years of crypto, there were very few exchanges where customers could transition their fiat money into cryptocurrency, and when they did so, they were usually required to first purchase Bitcoin, and only then purchase the cryptocurrency of their choice. This monopolistic advantage as cryptocurrency gatekeeper is one of the reasons that Bitcoin's volume rose so quickly during that same time period. However, as 2017 and 2018 unfolded, we now see that Bitcoin's influence is starting to wane, despite its continued role as the market leader in volume. Not unlike some other industries, we are now seeing the 'first mover' advantage starting to fade; it takes time for this to occur, but the trend is now clear which digital asset is taking away Bitcoin's role as the preferred mechanism for moving money into and out of the crypto market. Similarly, we're seeing many larger exchanges adding direct fiat pairings to all cryptocurrencies, leveling the playing field and making it easier for investors to quickly acquire their preferred digital asset. "Our team is working hard to have XRP withdrawals implemented as soon as possible." However, even in beta, they've indicated that users can trade using XRP pairings against fiat or other cryptocurrencies. 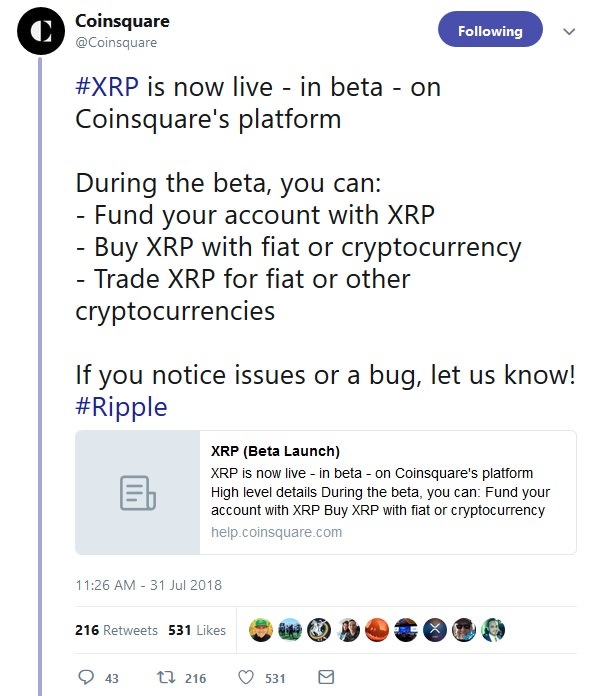 Coinsquare is a welcome addition to the XRP ecosystem, and represents one more valuable entry point into XRP for Canadian crypto investors. In previous blogs, I've detailed the overall plan that Ripple is following to ensure that the XRP Ledger not only matches the decentralization levels of competing networks such as Bitcoin, but exceeds them. The overall road map is almost nearing completion, with the final step to include a process where the 'recommended UNL' - the recommended list of trusted validators that serves as the default setting for validator operators - is adjusted to include a majority of non-Ripple validators. The process works thus: For every two new non-Ripple validators added to the recommended unique node list (UNL), Ripple will remove one of theirs. 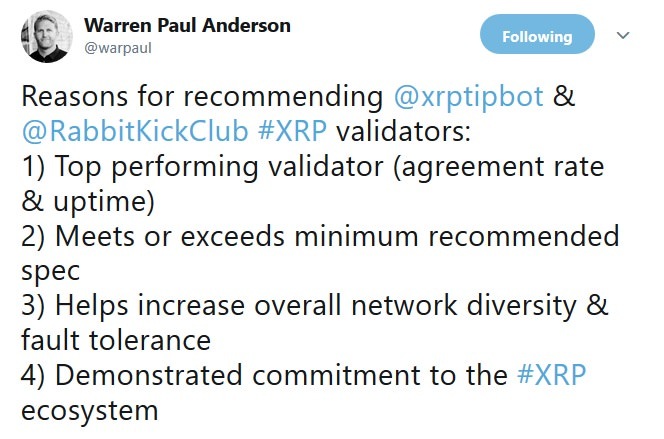 Congratulations to @RabbitKickClub, @xrptipbot (run by @wietsewind), and also the entire XRP Community for their representation on the recommended UNL. I admired the fun, diplomatic and detail-oriented nature of how CKJ Crypto News handled the YouTube interview - I was already subscribed to his channel, but I made a mental note to watch more of his videos. The session was filled with amazing content and of course background perspective from WietseWind about his own involvement with the XRP Ledger. Question: "You said you were going to work on getting XRP Tips on Instagram also? And plus, you also said something about ... Stream Labs...? Answer: "Yeah.... it's a company; they allow users to stream their gaming online.... They're focused on allowing people to tip the gamer who's streaming. They (currently) allow people to tip Bitcoin I believe; I offered to help them - of course for free - to implement XRP as well." That statement alone should be enough for those XRP Community members that may still not know about him to understand the level of his dedication. WietseWind's applications and work have helped the XRP community inject fun into almost all of our frequently-used social media platforms. The video is a great introduction to his work and his motivations: If you've been wondering how and why WietseWind is so good at what he does, in this video the interviewer asks him about his personal background and what prompted his love of code development and code architecture. The stories are incredible and give XRP fans even more reason to cheer the new member of the XRP default UNL. It was entertaining to see two of his two Eclectus - Dino and Pepper - make a special guest appearance throughout the whole video; I guarantee you will enjoy this interview! RareData is on a roll. As he continues work on his new project called the XRP Toolkit, he stopped and took the time to cull through previous developers' instructions for how to use the XRP ledger's native token creation functionality to organize an ICO. While the idea isn't new - the first ICO on the XRP Ledger was done in 2017 - the XRP Ledger is not as popular as Ethereum for organizing ICOs. Without assigning any sort of judgment on whether the concept is good or bad, RareData made the effort to compose a step-by-step guide for how to properly issue tokens in support of an ICO, and noted some key flaws in previous ICOs. Like his recent contributions to help tighten security of online wallets available for XRP, his documentation for ICOs is equally helpful. Currently, he's mulling the idea of conducting his own ICO as well; although he hasn't made a final decision on whether to do one or how he would organize it, he's currently organizing a poll via XRP Chat to gauge other community members' opinions on the matter. To read through his ICO procedure documentation, and to participate in the poll, refer to his thread on XRP Chat: RareData's ICO Procedures and Poll. NOTE: I do not endorse any specific ICO - or third party wallet. Please do your own due diligence before participating or using, respectively. While there has been multiple TED talks given on the topic of blockchain technology, I don't know of any that have focused specifically on Ripple Solutions or XRP. One XRP Community member decided to do something about it. On July 31st, @robsattler participated in a 'pitch' for Ted Talk speakers at James Cook University in Queensland, Australia. The idea is for presenters to try out for the higher-profile Ted Talk event scheduled for later in October of this year at TEDx JCU Cairns. Rob is a well-versed communications professional who has helped hundreds of businesses and projects with marketing their products and innovations: His Australian-based company is known as Redouble. The video doesn't show his full presentation, but it's one example of many regarding how XRP Community members are volunteering to take an active role in getting the word out about what the XRP Ledger can do for global commerce and international payments. The TED Talks platform is a very popular venue for thought leaders to inform viewers about new trends, topics and concepts that they may not have known previously; I hope that Rob is selected for further consideration by TED Talks. The final date and time for the short story contest submission was reached yesterday. @XRPeteSampras organized the contest via XRP Chat, and defined a deadline of midnight, August 1st. "Sometime on August 1st, a new post will be made on XRPChat that will include the title of each of the eligible entries in the contest that the community can vote on. Voting will go on for exactly one week until midnight, August 8th, 2018. This will allow the community to have at least a full week to read all entries and cast their vote for the best short story." 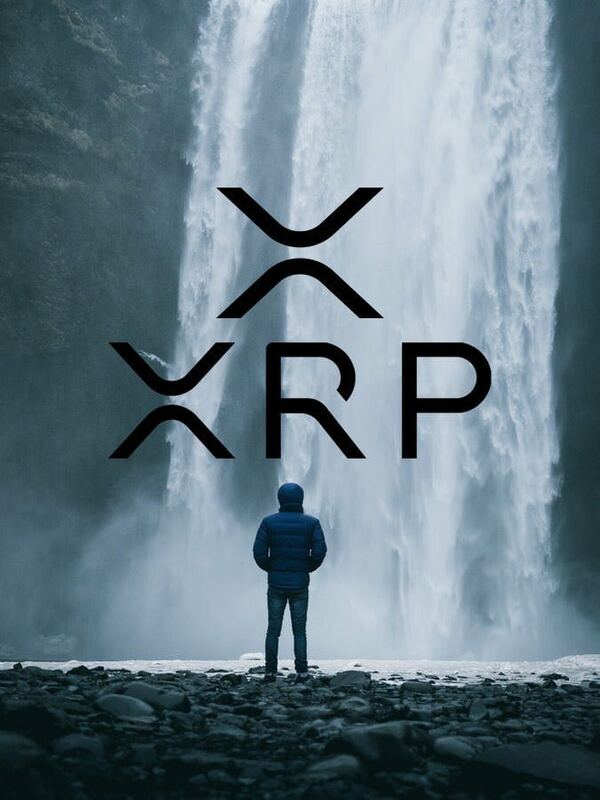 Note: only current XRP Chat members will be eligible to vote. As the world grapples with the concept of blockchain technology and the cryptocurrencies that have been created on top of it, governments, businesses, communities, stakeholder organizations, and individuals will all see inherent conflict based on the different ways that they've imagined the future. Modern solutions such as Codius, ILP and the XRP Ledger point to an alternate future that can be achieved if we work together to help make it a reality. It implies a willingness to let go of our distrust of each other and have constructive conversations with opposing camps; as it stands now, the crypto market is divisive, tribal, and has shown a tendency towards exclusivity. We can achieve meaningful change in the financial markets, change the entire structure of the way that money moves throughout the world, and create a version of the future where multiple digital assets can coexist and be valued according to their use cases. We need to help the most narrow-minded among us see this possible future and how to achieve it; I do not subscribe to the idea of 'one winner' in crypto. There should be room for any technology solution that can solve problems better than the technology that came before it.